A quality audit checklist is a quality record that tracks the questions and responses during a quality audit. The quality audit is a valuable tool for continuous improvement. Audits ensure your quality assurance system is sound. Audits are also necessary for ISO 9001 registration. To create an audit checklist, first reflect on the reason behind the audit. What kind of audit will it be? What audit category are you examining. See below. 3rd Party Audit are done by an outside independent audit organization. In case of an ISO 9001 audit the independent organization is the registrar. They normally do not have an interest in the final outcome. The 3rd party could be a registrar, government employee, or a firm hired by the company. The result of the audit could be a certification, license, acceptance, or an award. 2nd Party Audit are Audits from those who have a deep interest in the final outcome. This could be you auditing your suppliers, or your customers auditing you. The audit could be called a survey or an assessment. 1st Party Audits are audits done internally. They are a management tool with the emphasis on continuous improvement. The auditor(s) must be independent of the audit area. The audit should be aligned with the company goals and metrics. System Audits are looking at a particular system which includes multiple processes and can spread across several employees and departments. The audit of your calibration system can be consider a system audit. Your interaction chart lists your systems. Conformance Audits are audits to define system requirements. These are global in nature. For example a 3rd party audit of your ISO 9001 system is a conformance audit. Compliance Audit is an audit to regulatory requirements. This includes government agency audits. 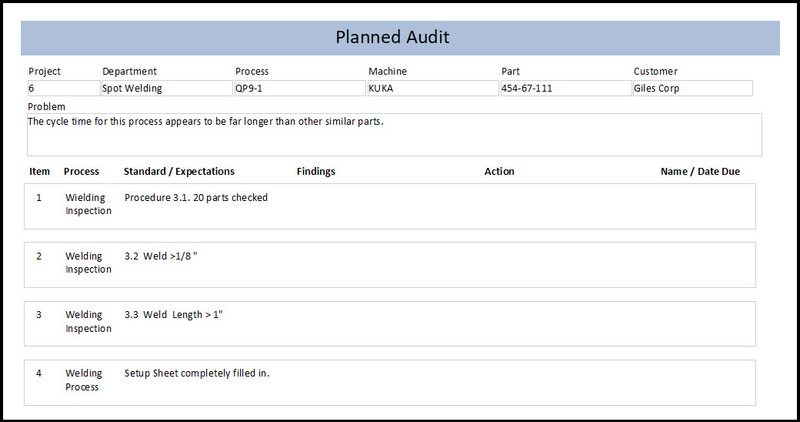 Process Audit is a focused audit on a set of processes within your organization. It examines adherence to procedures and specifications during production or service activities. Product Audit is a focus audit on the product itself. This may be an inspection activity or an out of the box audit. Department Audit is a focus audit on one department that looks at the processes, specifications, and systems in one department only. It will look at the different operations with in that department. It will also examine department organization and training. The audit focus is dependent on the organization needs. If it is a system audit, use your interaction chart to determine the system focus. If there are many problems with a particular process then conduct a process audit on that process. If there is a department with many issues then conduct a department audit. I recommend you use audit tracking software such as StreamLiner when conducting the audit. You may want to issue an internal audit engagement letter to the auditee. During the audit preparation, determine the quality audit checklist. This checklist is the audit plan. During preparation, review the procedures, standards, specifications and / or work instructions. These documents help you determine the quality audit checklist. Record audit questions on the checklist. Do not correct the person on the spot. During the initial finding report, document the issues found. State the facts and provide evidence. Use names and demonstrate the findings. Show quality records for evidence. Apply the quality audit checklist as the basis for the findings report. After the initial findings report, provide a copy to the corrective action team. Have a corrective action team meeting to issue the corrective actions. Document the corrective actions on the findings report. Be sure responsibilities and due dates are assign for the actions. The team will then complete the corrective actions. Document the completion of the corrective actions on the findings report. When all actions are completed, close out the report. For ISO 9001 certification, predetermine the management systems audit schedule. Use your interaction chart to establish the necessary systems to schedule. I recommend not scheduling out all of the system audits. Instead keep a 3 to 6 month schedule and update this every month. This will allow you to audit the concerned areas. I also recommend using a software application to track your audits. The software can track audit questions, schedule, results, and corrective action. These mistakes prevent an effective audit. Learn about using Audit Tracking Software, StreamLiner and make your audits much simpler. You may want to issue an internal audit engagement letter to the auditee prior to the audit. See here for more information on auditing the ISO 9000 system.